I must have ADD because I am starting another project. 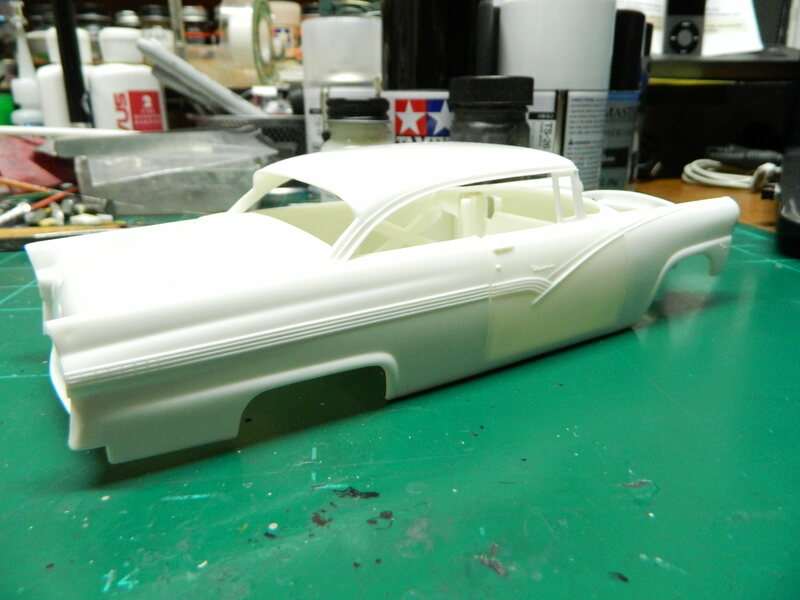 This time it is a '56 Ford Fairlane Victoria. I have seen more than my fair share of Tri-Five Hot Rod Chevys, but rarely do you ever see a Hot Rod '56 Ford since most of them are stock. They are out there, just not as common as a Chevy. My first car was a '56 Ford Customline 4-Door Sedan and I truly enjoyed owning it for 4+ months so I have an affinity towards a '56 Ford. I sold it so I could buy a '63 Ford Galaxie 500, but I can never forget that '56. This is the only picture of this car that I could find and I found it on Yahoo Images. 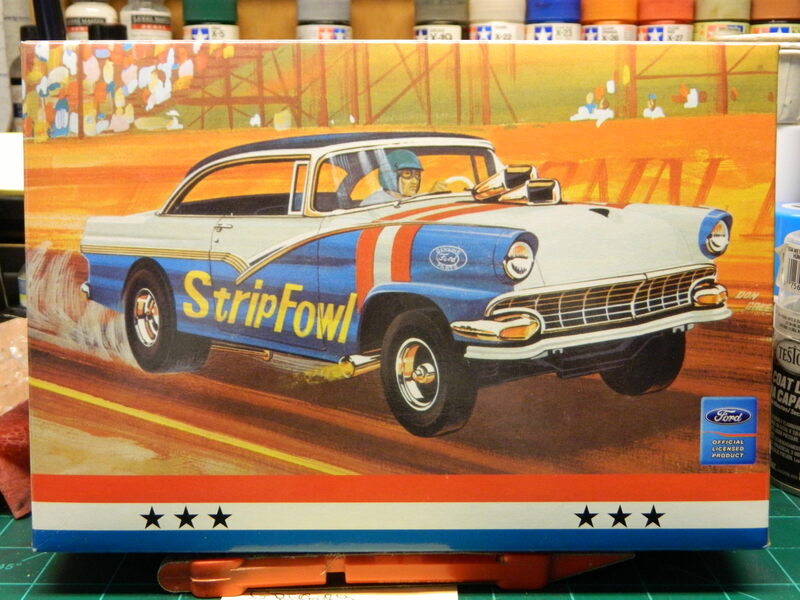 I'll be replicating this car, but with a few minor changes. 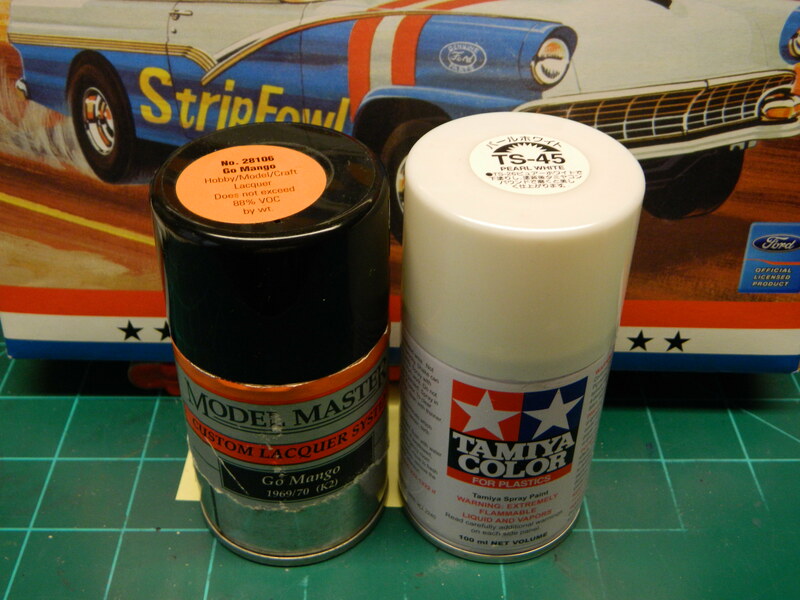 This is the kit that I am using, the AMT/Model King '56 Ford. 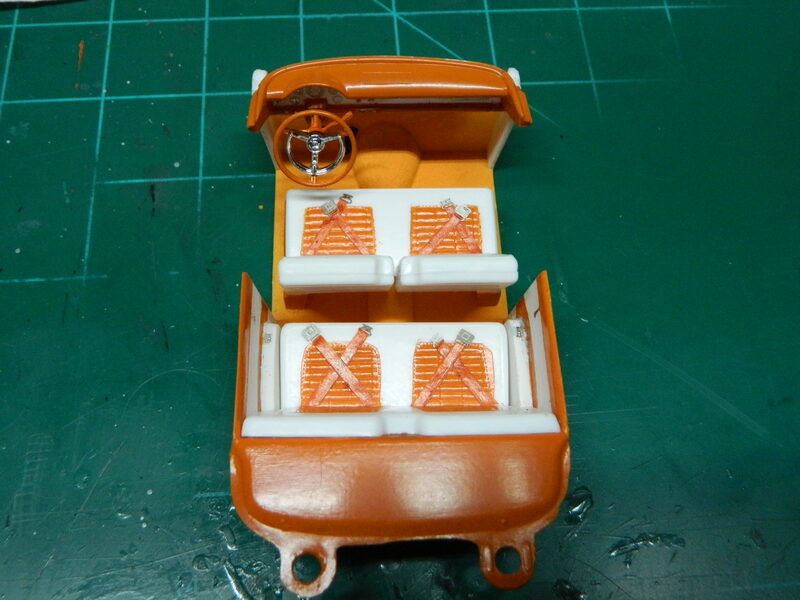 The body has been assembled, but I think I'll add a small rare earth magnet and a sliver of metal into the door jambs to help keep the doors closed. 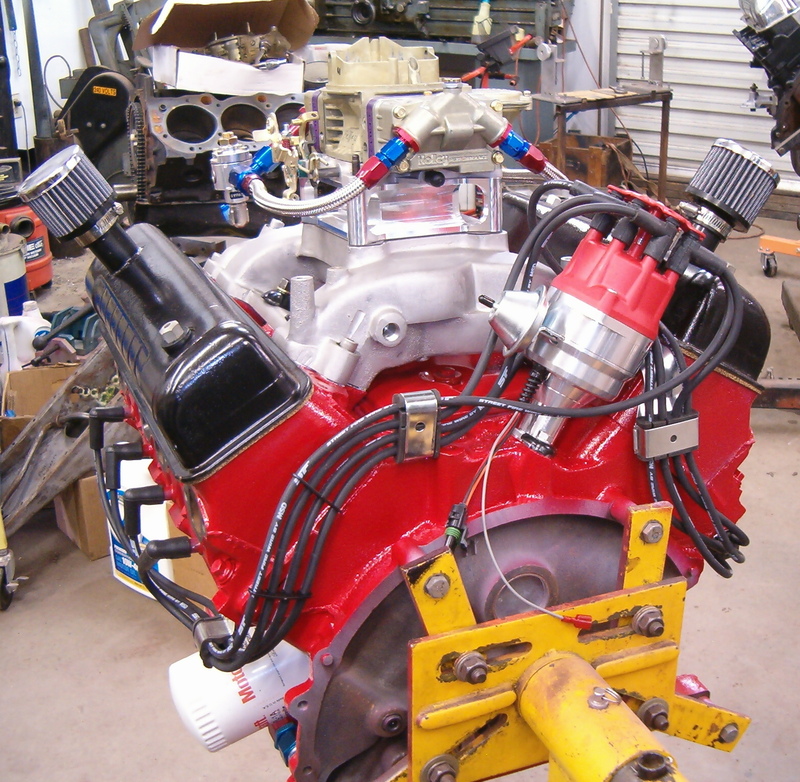 The 292 CI Thunderbird Dual Quad engine is mostly assembled and in the process of being wired and the transmission has been replaced with a Ford C4 Automatic trans. 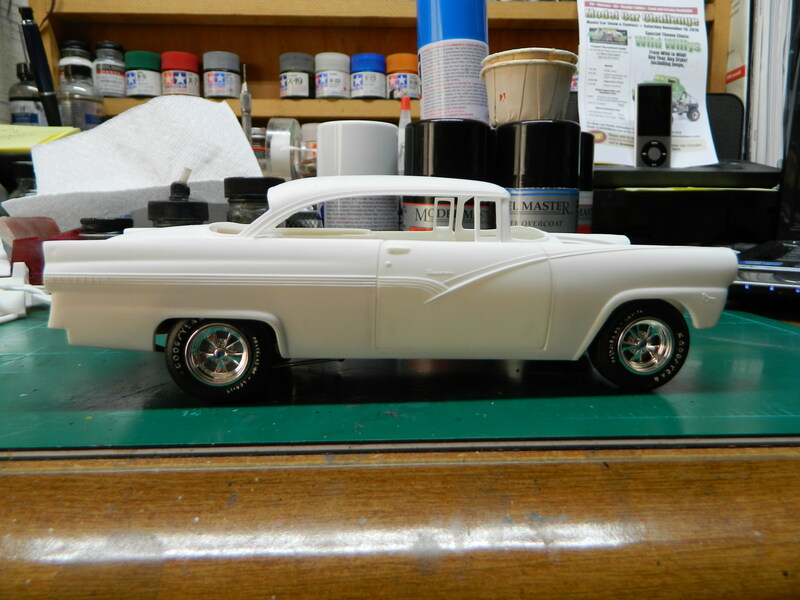 The body will be painted in a two-tone of Model Master Go-Mango roof and lower body with a Tamiya TS-45 Pearl White hood, trunk, and upper doors and a Tamiya TS-65 Pearl Clearcoat. That is one sharp car you're going to replicate Mike! Will be watching man. Thanks Joe! I wish I could find out more about this '56 Ford, but I can't seem to find anything else about it. It would definitely satisfy my curiosity about this car. The picture came from a Pinterest account which means it could have been on someone's album and the picture was copied and repasted many times over. I have the same problem with the Mopar I'm doing. It was a calender picture on a calender that Dwayne had and gave to me. The only thing I've been able to find out about it is it isn't a "hemi car" but a "Max Wedge" car. Be following this one. 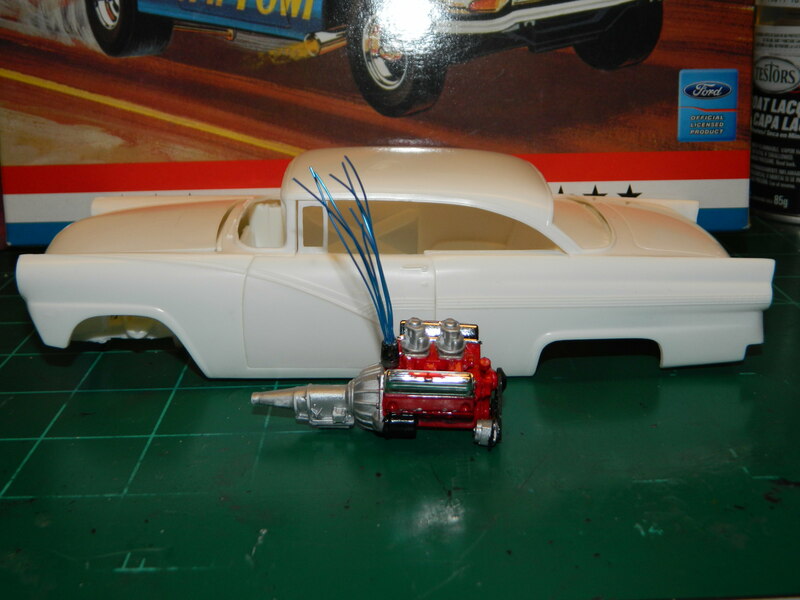 My ex father law had a 55 customline as his first car which i uesd a 56 kit but using the grill from the 55 ford dragster kit to build a representation of the 55 he had. I think also being here in australia ours may have been a little diferent. 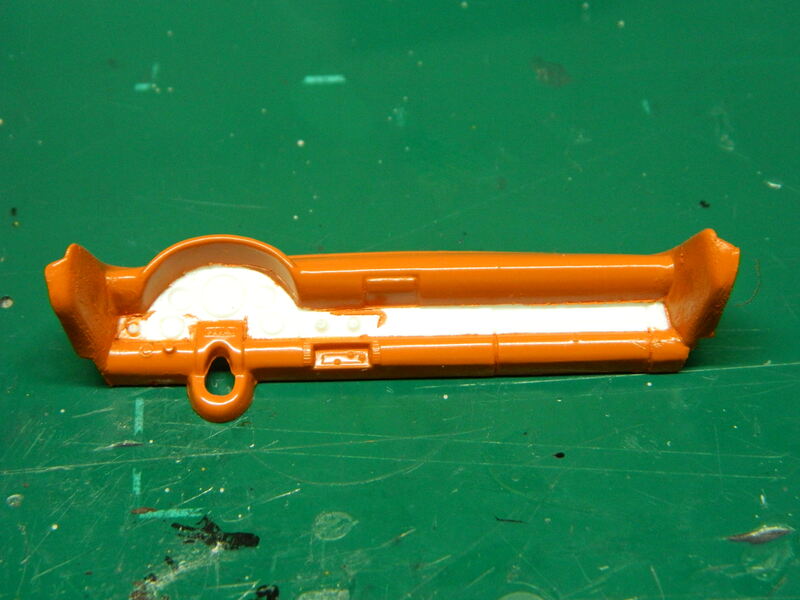 I was able to buy a right hand drive dash which helped. Nine years ago I found a calendar picture of a '69 Dodge Charger SE with a Hemi. I was fortunate enough to find some information about that car. 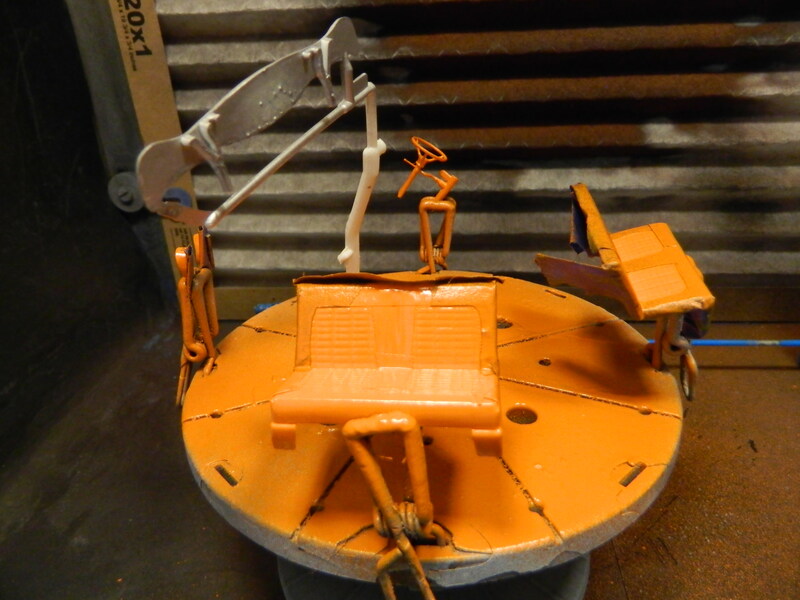 It was a "Pilot" car which is the first vehicle of a production run test fitting new pieces for the model year. From what I have found doing research was that the Hemi was never available on the SE, only the R/T. The car was discovered minus the engine with a tree growing in the engine bay and rust up to the door handles by the owner of a Keisler Engineering and the car was rebuilt for a TV show called Chop Cut Rebuild that was on Speed Channel and later on MAVTV. I built my version of that car in May through August 2010 using a resin auto trans and console and wheel covers from the '68 Dart GSS. Here's a link to that build. 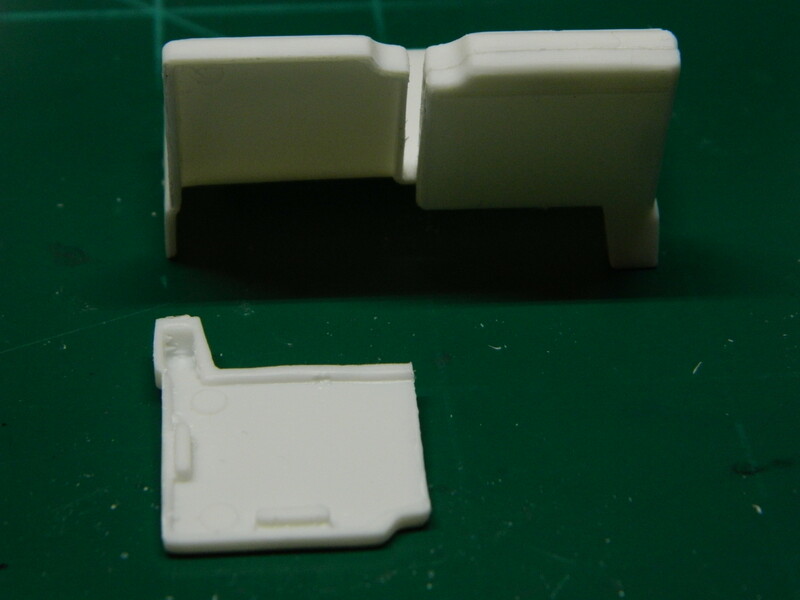 I hung the doors on the body, but these are not the original doors from the kit. 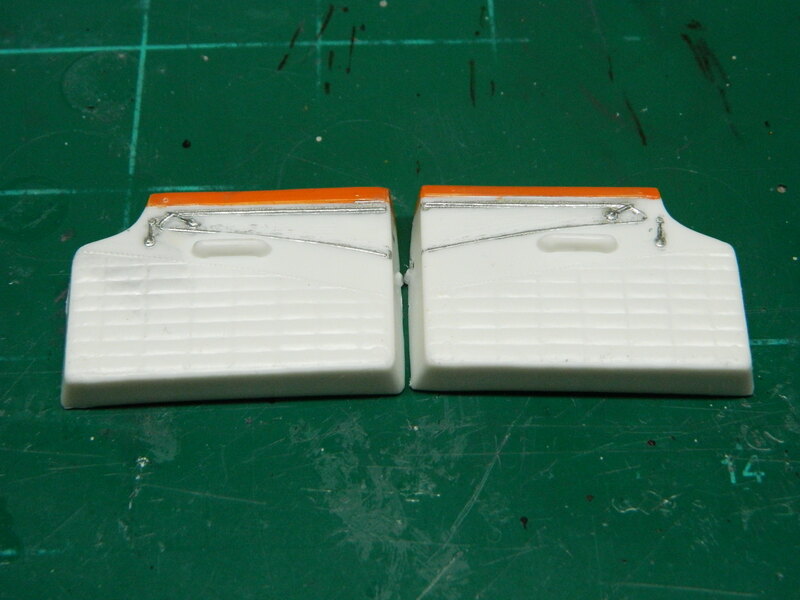 Those doors were mis-shapened and these came from streetrod aka Mr. Prestigious aka Barry! Thank you Barry! The driver's door had to be re-hung after the glue dried since it didn't want to shut properly. 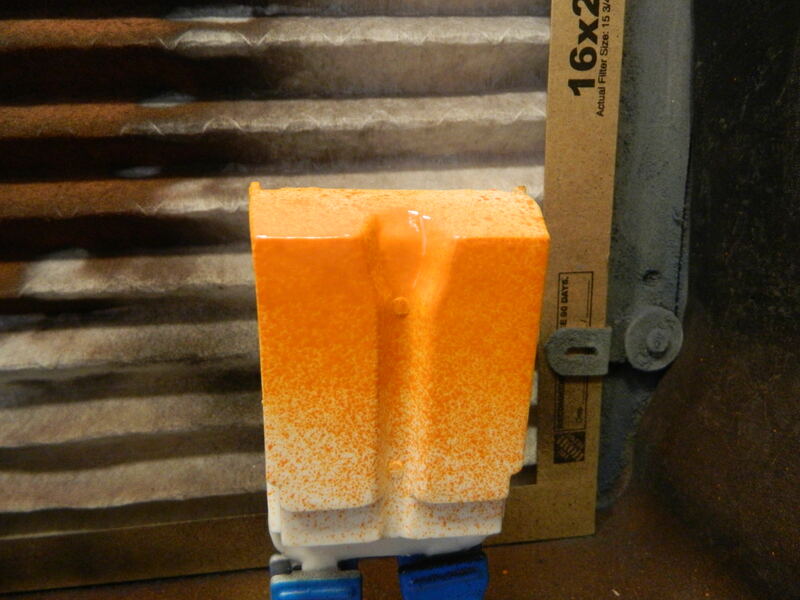 I still plan on having a rare earth magnet and a piece of steel in the door jambs to help keep them closed. 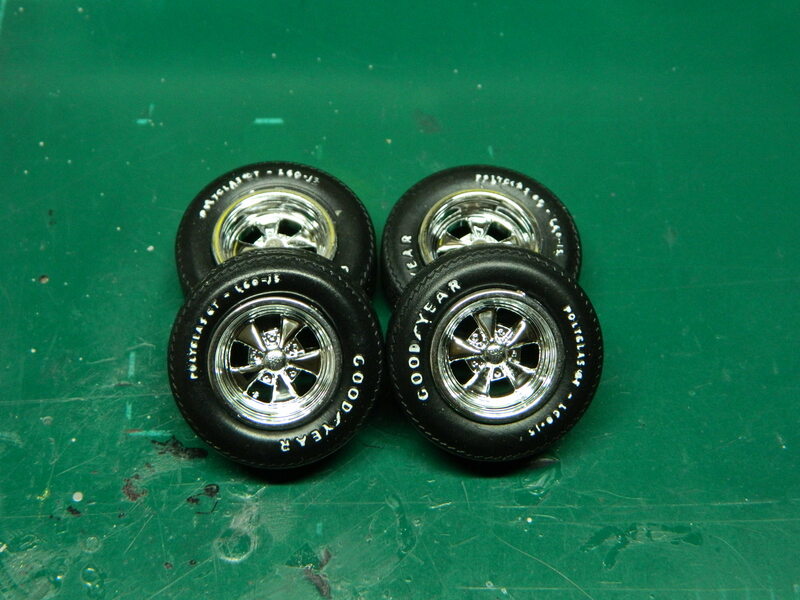 I had these tires in my parts box, so I lettered them with a white Gelly Roll pen and my magnifier. 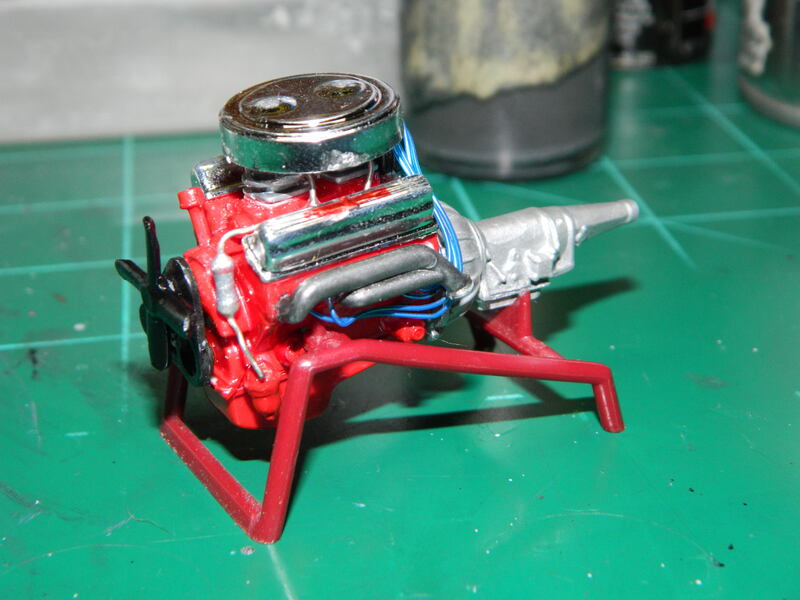 I've been working on the 292 CID engine. I still need to add an ignition coil and throttle linkage, touchups including painting the fuel filter, and the air cleaner. 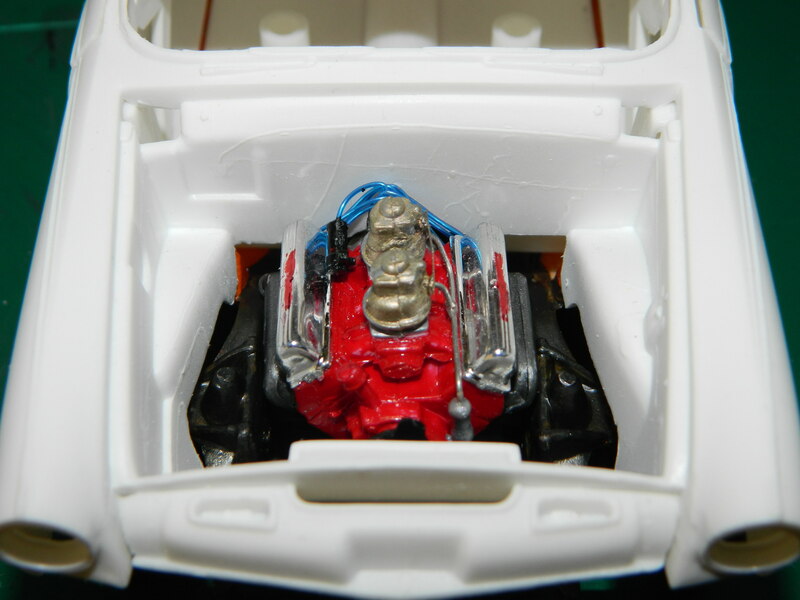 I have finished the 292 CID engine for my '56 Fairlane Victoria. nice engine. i love the fuel resistor! Very nice job! Out of idle curiosity, why did you opt for the 292 instead of the 312? There are no visual differences between a 292 and a 312. Even on a full scale engine, you have to inspect the crank and heads to tell the difference. It's too late now. But the distributor on a Y block mounts at an angle towards the passenger side. You may be able to fix it with the plug wires attached. May not. Up to you, of course, whether or not to fix it. I wasn't aware that the 312 had an angled distributor or was available in 1956! I went with a 292 since that was the biggest engine for a '56 Ford Fairlane and it is what they said it was in the kit. 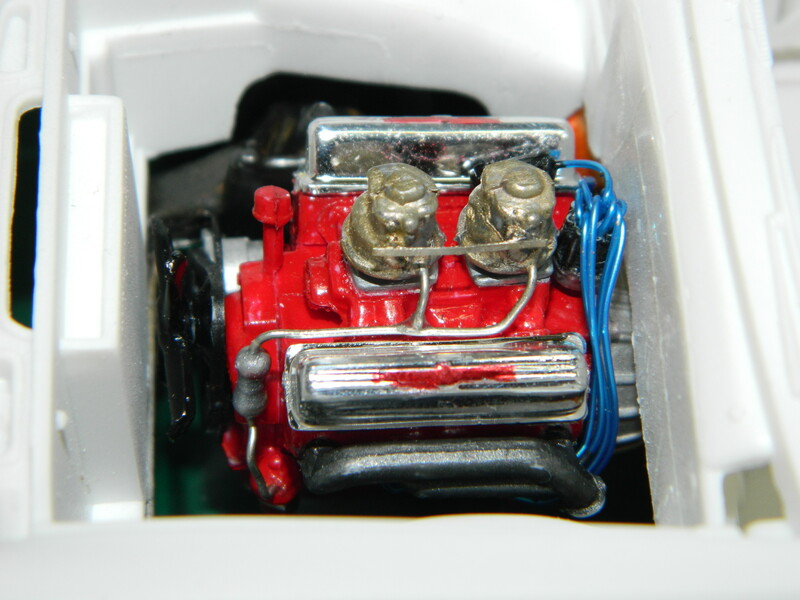 Based on what I have seen on Google Images, the distributor is not only angled, it is on the other side of the engine block. 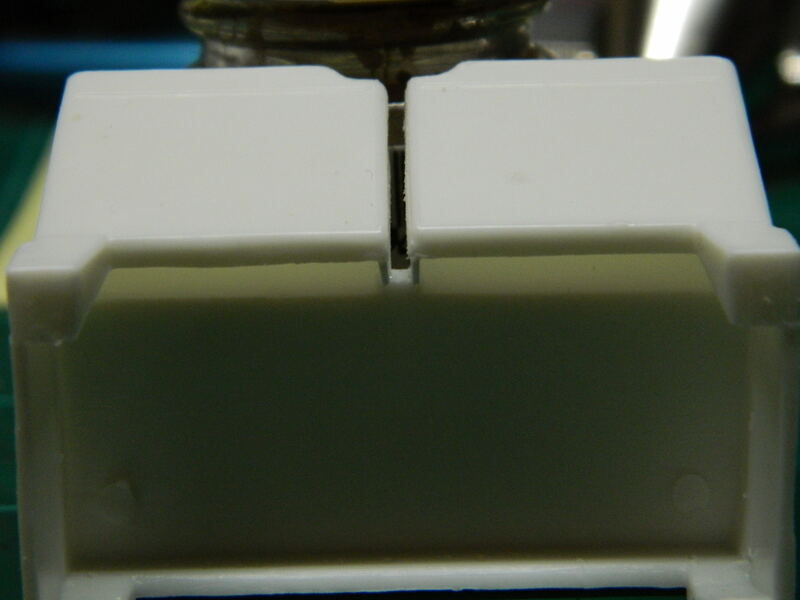 I used a distributor that I fabricated a base for and drilled a hole off-center to the driver's side of the block. 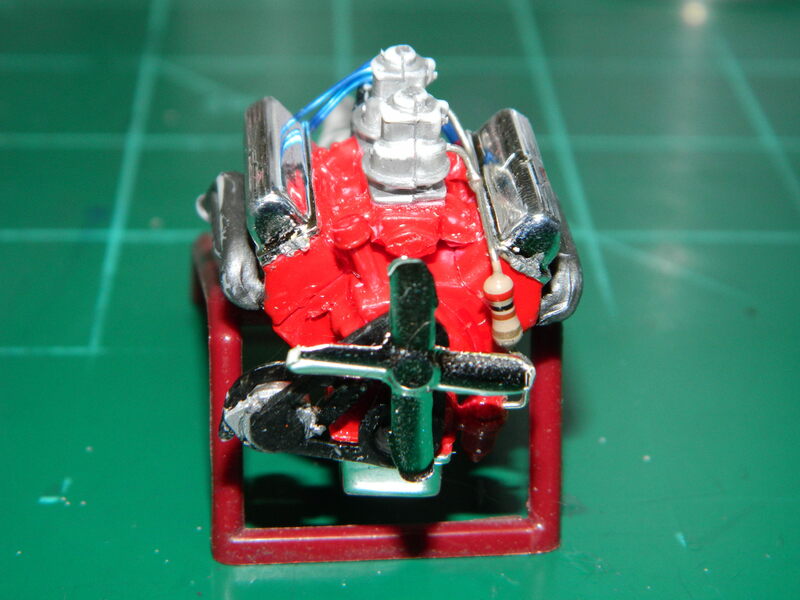 Therefore, it is a 292 CID engine. I did a mockup this morning to check my progress. The rake looks spot on for what I am looking for. 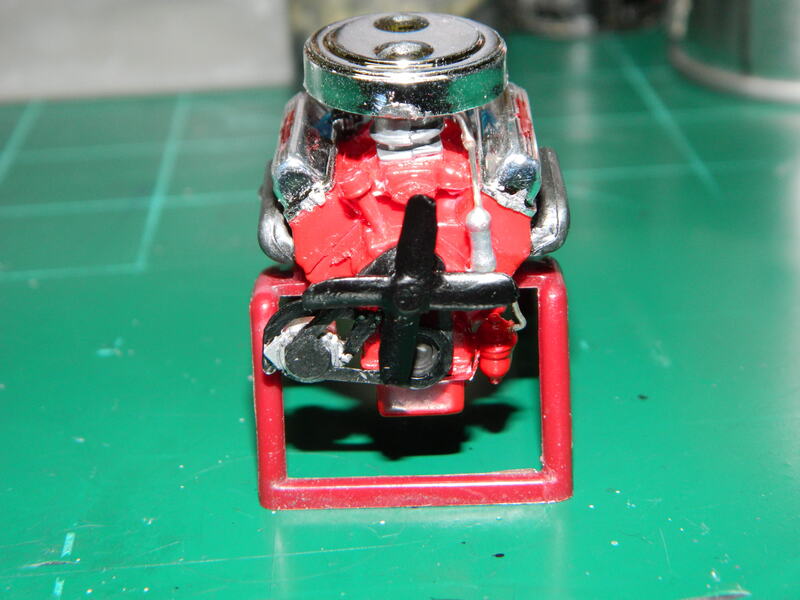 I wanted to see what the engine mounting would be like since I replaced the manual trans with a C4 auto trans. I was worried that the fan would be hitting the radiator, but it seems to clear it easily. But, the engine mounting is only at the oil pan and there are no frame mounts for the engine. I'll have to make a set of frame mounts that go to the engine mounts. Other than the engine mounting issue, I am very happy with the mockup and now I can move forward with bodywork and painting the two-tone paint scheme. I wasn't aware that the 312 had an angled distributor or was available in 1956! The Tunderbird emblem towards the front of the front fender indicates a 312 engine. From Wikipedia...The 292 cu in (4.8 L) Y-block was offered as an option and was called the Thunderbird V-8. Based on my research, in 1956, the biggest engine available for the Thunderbird was the 292. The Thunderbird emblems indicate a Thunderbird based 292 CID engine was available for the Fairlane as well as a 312. 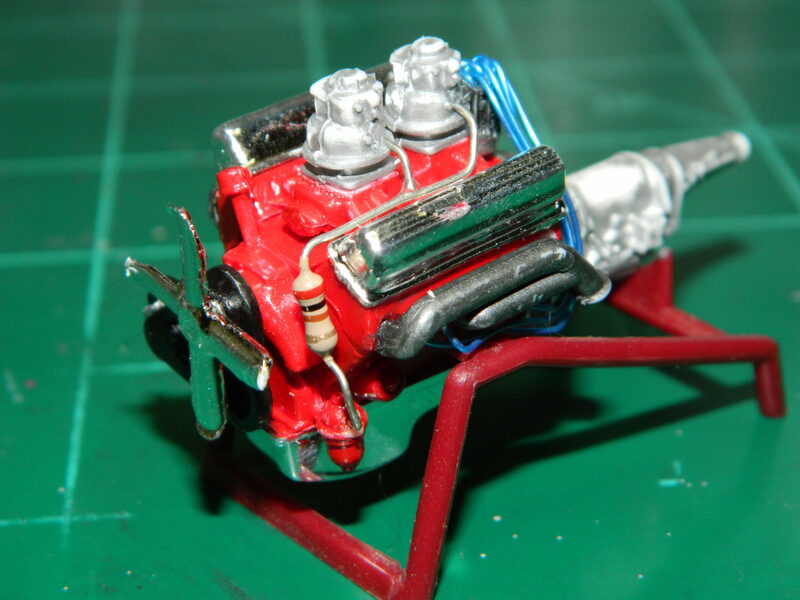 I am building my model based on the info on the box and the instructions which call for a 292 CID engine. I was told that the only way to tell a 292 and the 312 apart from each other was to disassemble the engine and check the crank. 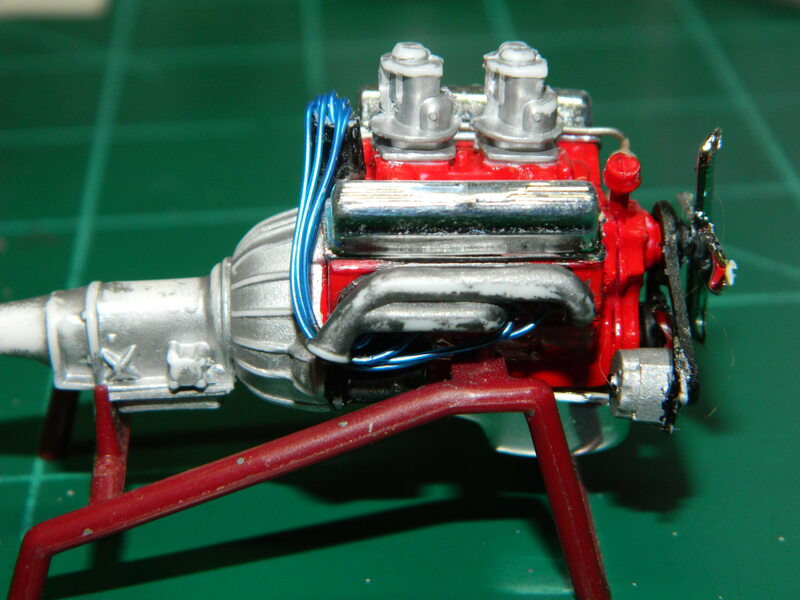 My research also indicates the 312 had a distributor set at an angle on the passenger side of the engine centerline. 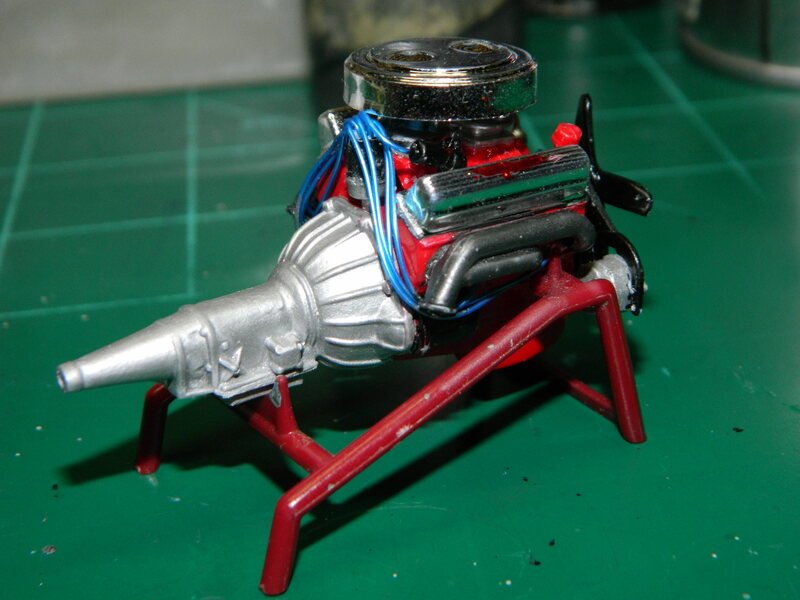 I built my engine with the distributor straight up on the driver's side of the engine centerline. I am perfectly happy having a 292 instead of a 312. Not a big deal...I think you used the displacement for the '55; that same Wikipedia entry shows the '56 having a 312 available. 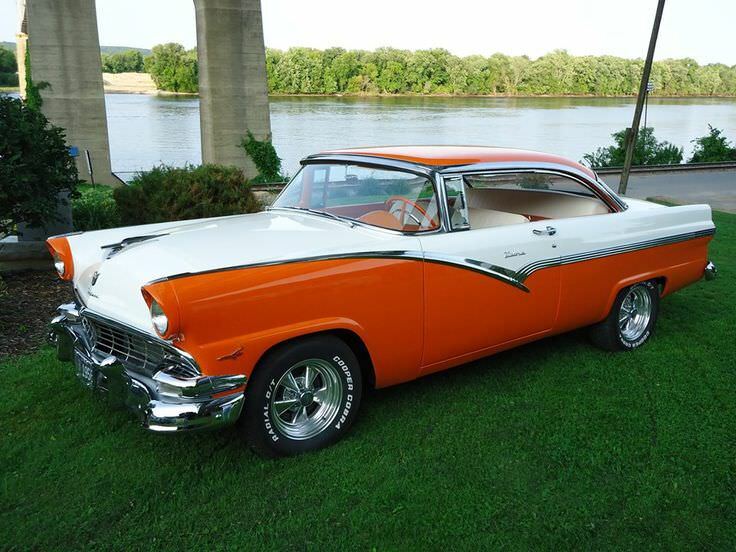 For the 1955 model year the Fairlane name replaced the Crestline as Ford's premier full-sized offering. Six different body styles were offered, including the Crown Victoria Skyliner with a tinted, transparent plastic roof, the regular Crown Victoria coupe with lots of stainless steel trim, a convertible Sunliner, the Victoria hardtop coupe, and traditional sedans. All featured the trademark stainless-steel "Fairlane stripe" on the side. Power options were a 223 cu in (3.7 L) straight-6 engine and a 272 cu in (4.5 L) V8. The 292 cu in (4.8 L) Y-block was offered as an option and was called the Thunderbird V-8. Thanks Oldschool4X4. I was not aware that all Y blocks had the angled distributor or I may have forgotten that the 272 CID distributor in my first car was angled, but that goes back to the Winter of 1972 and I simply can't remember. Ray, the information I have presented here is for a 1956 Ford Fairlane Victoria. 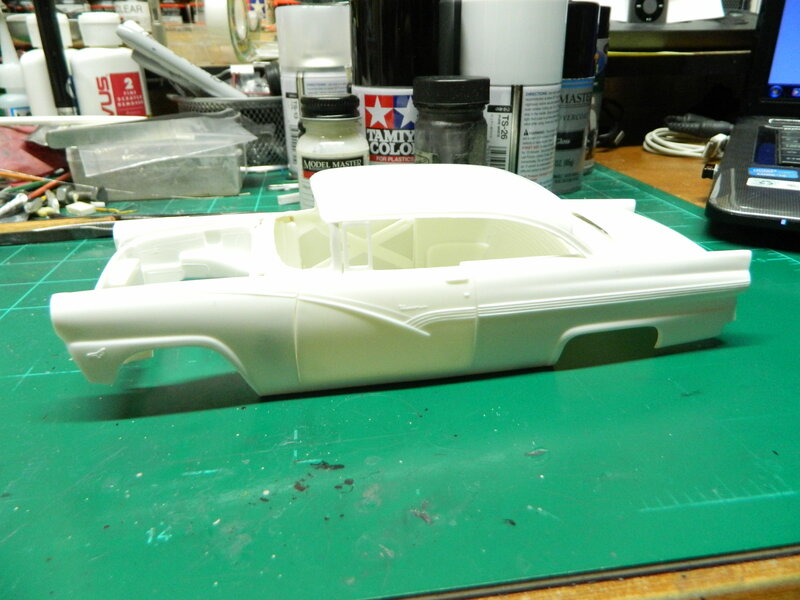 The research I have done applies only to the car I am copying and the model I am building. If you have any doubts of this information, I would suggest that you contact the Admins of the pages where this information came from, Wikipedia and the various Ford related web sites. 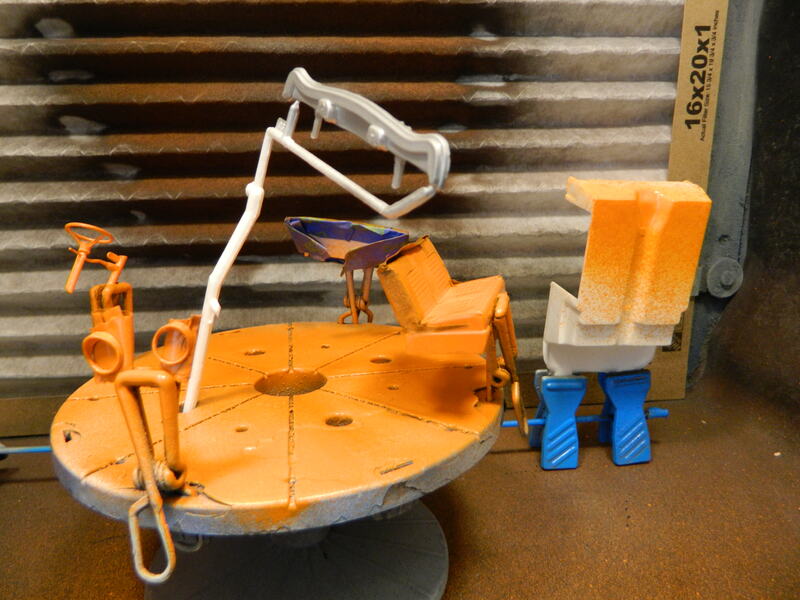 As Oldschool4X4 pointed out, this is my model and yes, I am building it my way.
" Its your thing, do what you wanna do... "
It's my way or the highway! 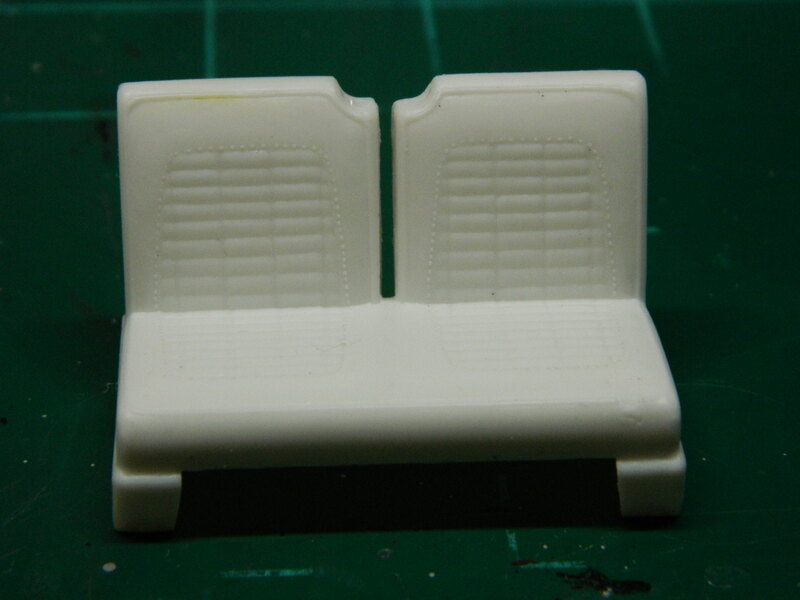 Been thinking about the front bench seat and I decided to open the splt backs. I used a chisel-point and a No. 11 pointed blade to cut out and to trim the seat back. 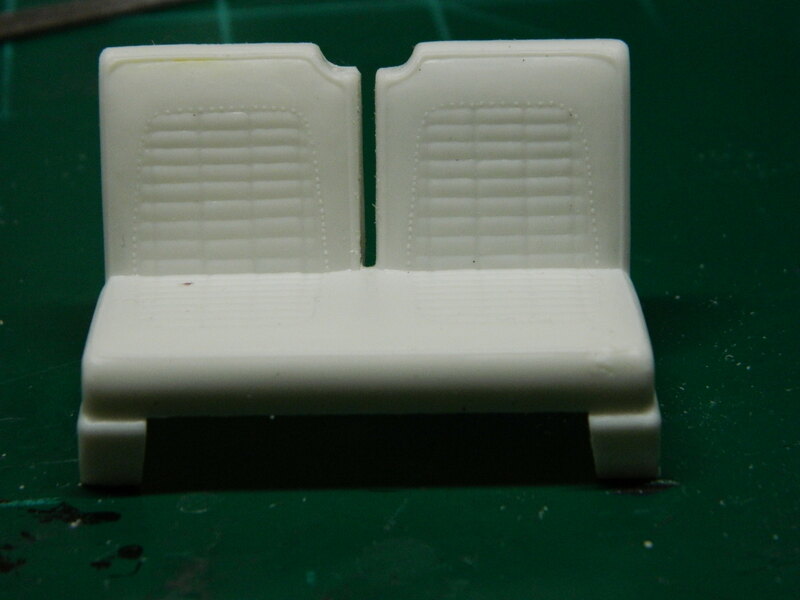 I just need to fill in the inside of the seat backs with some styrene. I finished assembly of the front bench seat. 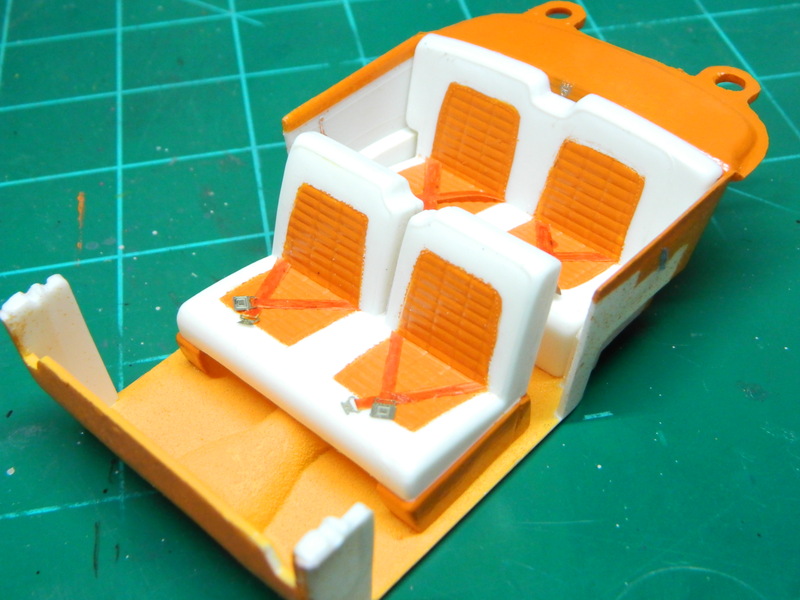 I filled in the sides between the seats with some strips of sheet plastic. I did a little painting this morning. 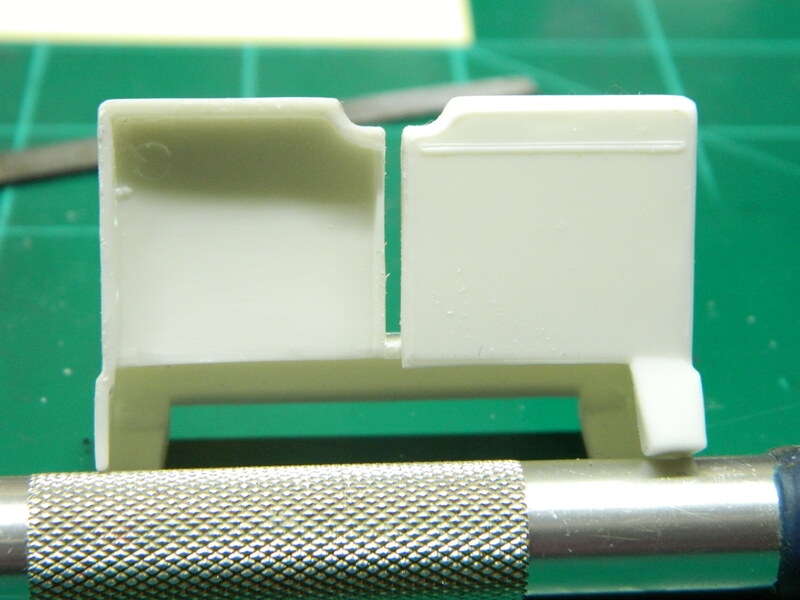 Model Master Go-Mango on the interior pieces and Tamiya TS-17 Gloss Aluminium on the splash pan. 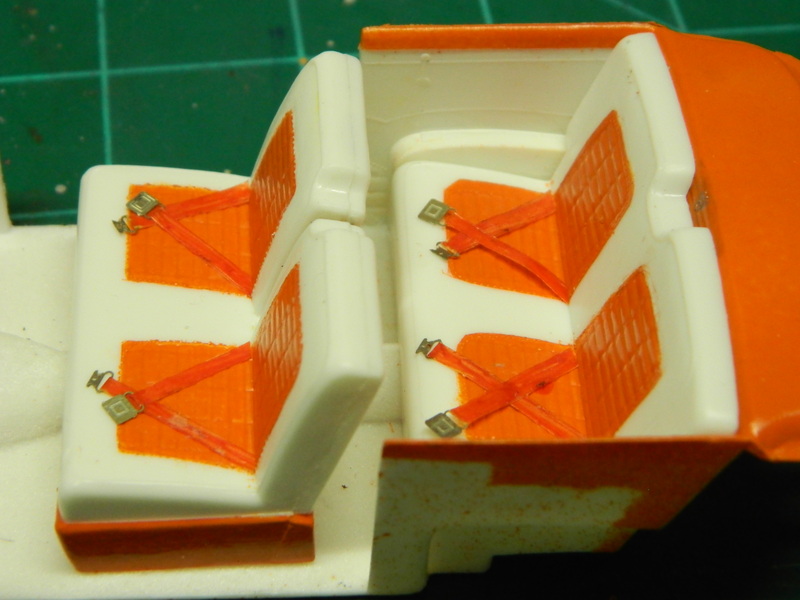 I made some seat belts today with seat belt hardware from Model Car Garage and some strips of Tamiya 1/4 inch masking tape. 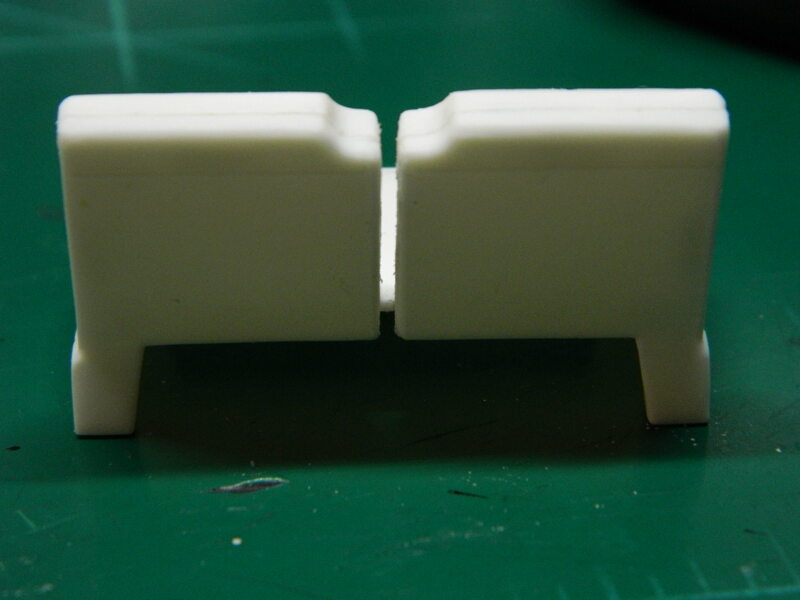 I cut the strips of tape with my hobby knife at 3/32 inch and fed it through the hardware. I doubled over the tape and stuck them together on the sticky side. I used an orange Sharpie to color the tape. This is just a quicky mockup for illustration purposes. 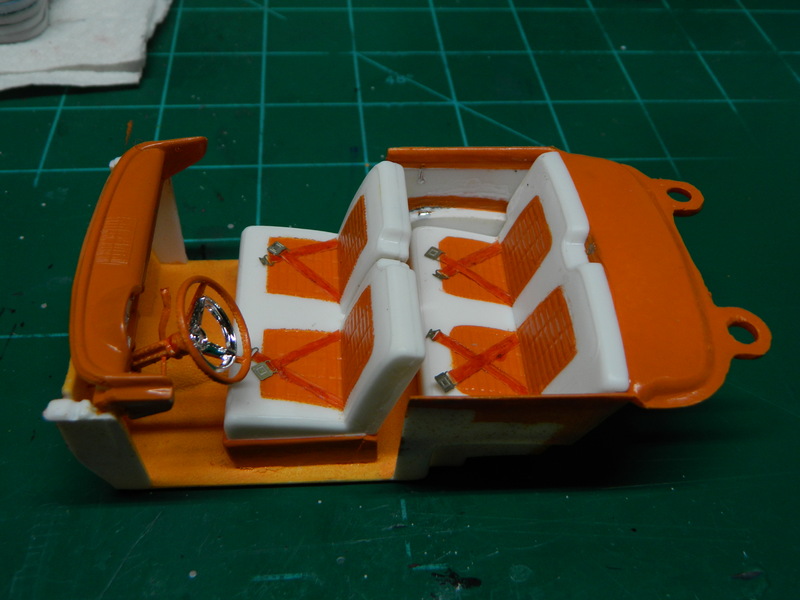 I fired up the paintbooth this afternoon and did some painting on the '56 Ford interior. I have some cleanup to do on the dash. I am liking this ! What I would've done to the seats is a little more . Wanna really fool everybody ? 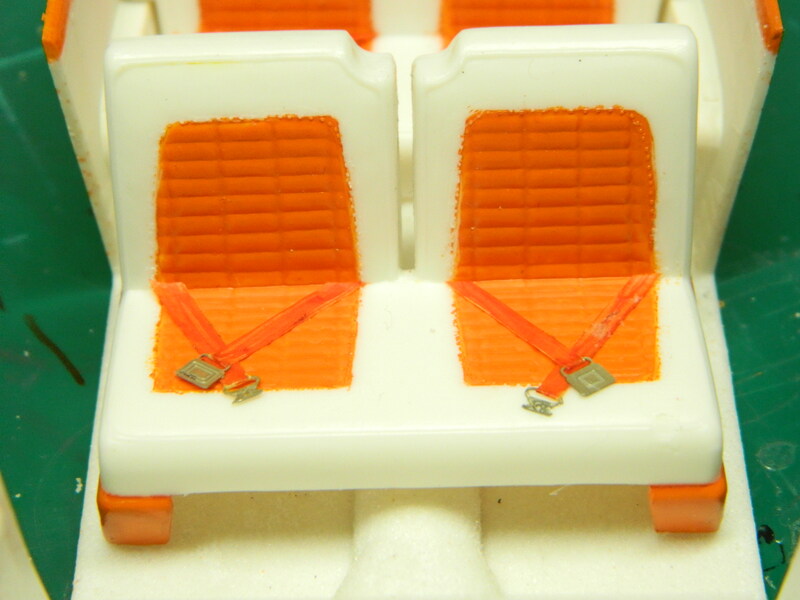 Take a triangular file and file around the bottom of the seatbacks . Continue this line to the back of the unit . That way when you look inside , it looks like the seat actually folds forward . That's always a " Gotchya " Good job so far ! Thanks for the suggestion oldcarguy! That's a good idea! 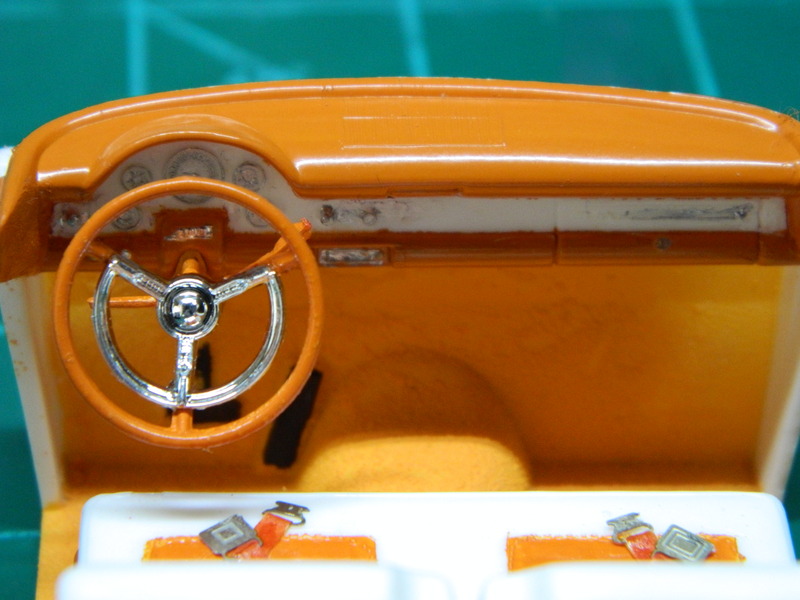 I have completed the interior of the '56 Fairlane! 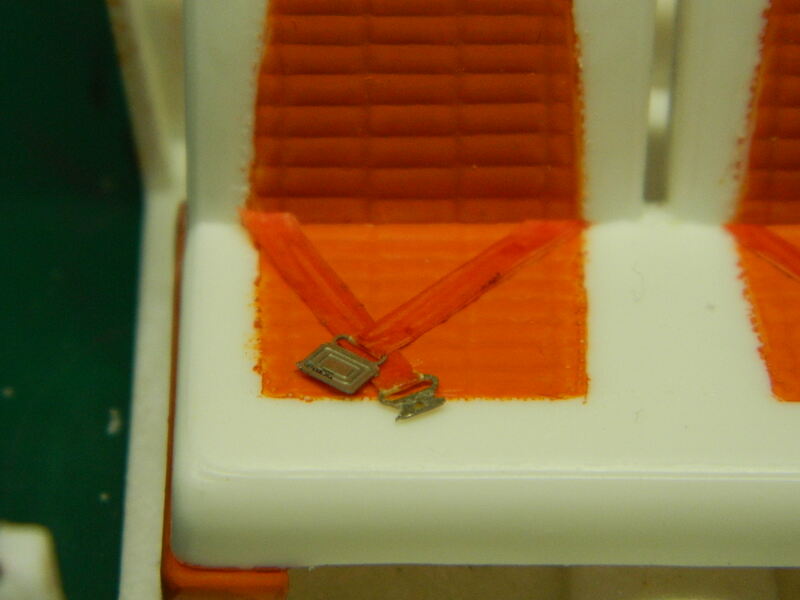 I had looked at other images of a '56 Ford interior and I noticed white seat belts with an orange seat surface. Oh well, too late! This is coming along well. Nice project.